The city of Kyoto is located in the middle of the island of Honshu and is a wonderful base from which to embark on fun day trips to the region's top sights. One of Japan's largest and most visited cities, Kyoto is connected to the country's excellent high-speed trains, which can whisk travelers pretty much anywhere they care to visit relatively quickly and in comfort (Japan's highway network is excellent, too). Interesting places to visit, such as Nagoya, a little more than a two-hour drive east, can be reached by rail in 1.5 hours, dropping you off in the center of the city, where the majority of attractions and top things to do can be easily accessed on foot. Another easy day trip includes the slightly longer trek to Hiroshima to visit the sobering museums and monuments marking the city's devastation when the first atom bomb was dropped in 1945. And for those seeking a little traditional Japanese culture in a smaller, less crowded location, the tea shops and family-run restaurants of Kanazawa are a must-visit. Plan your sightseeing adventures with our list of the top-rated day trips from Kyoto. Even closer to Kyoto than Osaka, a day trip to the lovely historic city of Nara is best undertaken by car or as part of an organized tour due to its relatively (by Japanese standards) remote location. Once here, you'll take in the very best of the area's temples and shrines, as well as the historic Nijo Castle. Looking as if untouched by time, Nara's many fine old buildings and streets means it's one of the most popular places to visit in the country, so be prepared for crowds. But it's all worth it, especially as here, you'll have the opportunity to also enjoy seeing some of the country's most important national treasures and works of art. Other exquisite old temples to explore include Kofuku-ji Temple (7th century) and Tōdai-ji (8th century), the latter famous for its massive statue of the Great Buddha dating from AD 749. Other features of Tōdai-ji that make it so popular are its impressive Great South Gate, with its many columns and huge eight-meter-tall statues guarding the temple entrance, as well as the world's largest timber building, the massive Hall of the Great Buddha. These and other great points of interest can be enjoyed on formal tours such as the Kyoto and Nara Day Trip from Kyoto, an excellent option that also takes in Nijo Castle, with lunch (and all admissions) included. An easy 1.5-hour commute by train east of Kyoto, the busy port of Nagoya is well worth taking the time to explore. Thanks to its port, Nagoya has long been an important manufacturing city, and is particularly famous for its ceramic industry, which can trace its roots back as far as the 12th century (many tourists are drawn here specifically for the city's fascinating workshops and factory tours). This industrial wealth led to the construction of many imposing structures, such as its 16th-century castle, completely rebuilt after WWII. Castle tours usually take in the 48-meter-high main tower, with its fine gilded dolphins, along with its art treasures and excellent views over the city. Another Nagoya highlight are its many fine old temples, the oldest of which, Atsuta Shrine, dates as far back as the 1st century (be sure to check out the site's Treasury with its works of art, ceramics, and jewelry). The port itself is also worth exploring and is home to the Port of Nagoya Public Aquarium, a small marine museum aboard the historic vessel the Fuji, and some pleasant coastal walks. It's also a popular spot for cruises to stop, and you'll often see tourists disembarking and heading ashore to explore the port and the city's superb shopping. Although a lengthier trip (it's three hours due west of Kyoto by high-speed train), a day trip to Hiroshima is well worth the time. It's hard to believe, given its beautiful setting, that this fine city, forever remembered for the dropping of the first atomic bomb on August 6th, 1945, was ever a military target. Today, Hiroshima is appropriately referred to as the world's "peace capital" due to the many notable attractions focusing on this devastating historic event, and the need to ensure it never happens again. 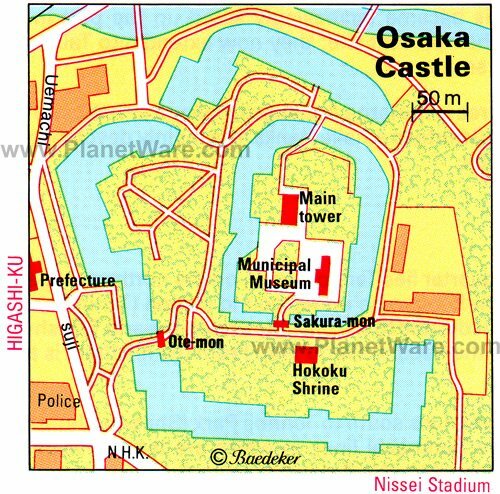 Perhaps the most visited of these sites is Hiroshima Peace Memorial Park, dedicated to the many victims of that fateful day. Encompassing a number of important memorials and museums relating to the event and its aftermath, this beautiful park - popular for its colorful cherry blossoms each spring - is at the very epicenter of the blast and each year attracts more than a million visitors. Must-sees in Hiroshima include the Peace Memorial Museum; the Memorial Cenotaph; the Flame of Peace; and the famous Atom Bomb Dome, with its ruins of the old Chamber of Industry and Commerce. All of these points of interest can be best seen as part of an organized tour, such as the Hiroshima Peace Memorial Park and Miyajima Island tour. This full-day excursion includes all transport and admission fees. While a long-day, you'll have time to nap on the train ride back to your hotel in Kyoto. 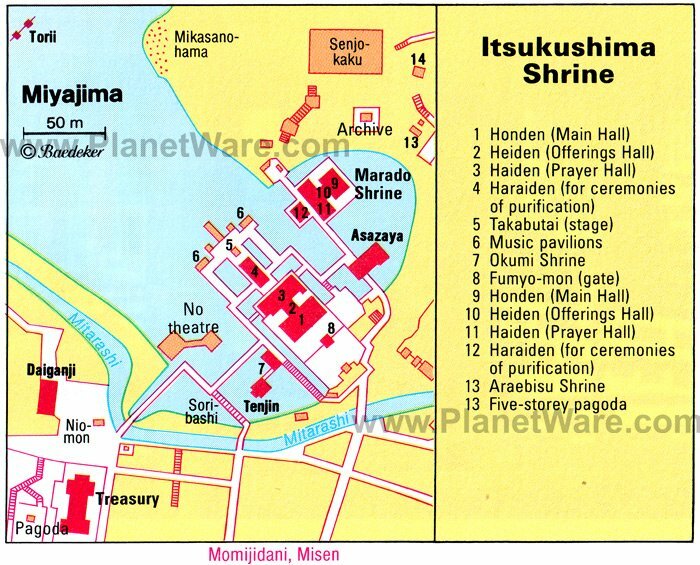 Occupying some 30 square kilometers of Hiroshima Bay, Miyajima - also known as "Shrine Island" - is best known for the beautiful Itsukushima shrine. There's certainly enough to see and do on the island to warrant spending the best part of a day here, and the views over the city at night are wonderful. Tracing its roots back to the 9th century, the island features colorful buildings, which are supported on piles just above water level and look like they're actually floating. It's quite a unique experience exploring the temple's many bridges and historic buildings, as well as its beautiful park-like surrounds. Some of the best buildings to visit include the Main and Offerings Halls, along with the Prayer Hall and the Hall of a Thousand Mats. Also, be sure to catch a performance of traditional dances and music, a particular treat during the island's many important festivals. If you're not in a hurry, be sure to stop in one of the tea rooms for a traditional beverage and lunch. Although worthy of a visit on its own, Hiroshima's famous Shrine Island, Miyajima, should - especially if you're traveling from farther afield - be included as part of a day trip including Hiroshima Peace Memorial Park (the two sites are relatively close). An hour-and-a-half west of Kyoto is the city of Himeji, famous as the site of Japan's largest fortress, the UNESCO World Heritage-listed Himeji Castle. This magnificent 14th-century palace, also known as Shirasagi Castle - or White Heron Castle - for its exterior walls that resemble a flying white heron, is a delight to visit and can easily consume a few hours of your day as you explore the site's more than 80 buildings, fortifications, and parks. Highlights include the views from the five-story-tall main keep, as well as exploring the steep, winding narrow walkways leading up to the castle. After your visit, if time permits, head over to nearby Koko-en Garden, a traditional Japanese garden encompassing the former grounds of a Samurai warrior's home (be sure to also check out the tea house). A fun, easy day trip from Kyoto, Arashiyama is just a half-hour commute and is the perfect getaway for those pressed for time and not wanting to stray too far from the city's downtown core. Although considered a suburb of Kyoto, Arashiyama has managed to preserve its small-town, rural appeal, thanks in part to its lush vegetation and it being spread across a number of hills. One of the most enjoyable attractions here for families is the Iwatayama Monkey Park. Although a 15-minute walk from Arashiyama's town center (all of it uphill, but worth it for the views), you'll be rewarded with the chance to observe the park's more than 170 monkeys roaming free in their natural habitat. Afterwards, walk to the spectacular Arashiyama Bamboo Grove, a beautiful area of tall bamboo, which towers high above you. Be sure to also check out the many local vendors along Saga-Toriimoto Preserved Street, famous for its historic Japanese architecture and the wide array of bamboo products sold here, including traditional mats and baskets. And if you've still got energy to burn after all that walking, rent one of the fun paddle boats near the iconic Togetsukyo Bridge. Although located 2.5 hours northwest of Kyoto - and one of the few day trips from the city that is easier undertaken by road rather than rail - the traditional Japanese vacation area of Kinosaki Onsen is well worth the journey. Situated in the picture-perfect Sea of Japan coastal region of Hyogo Prefecture, unspoiled Kinosaki Onsen stretches along a lovely tree-lined river offering many quiet places to stop and enjoy the serenity of this small town, popular since the 8th century for its bountiful hot springs or "onsen." It's a little like stepping back in time, as the customs and even the attire of the locals, often seen wearing traditional wooden clogs and kimonos, have been preserved just as they would have been in the town's early days. And, of course, no trip to Kinosaki Onsen would be complete without visiting at least one of the many wonderful public baths dotted around town. The town is also making a name for its cuisine, best sampled at any one of the many fine family-run traditional restaurants dotted along its streets. Another easy two-hour train ride away is the delightful city of Kanazawa. In many ways, it's a microcosm of the very best urban experiences in Japan. You'll find everything needed for a full-on Japanese experience, from traditional local culture to great food and fine historic attractions. A highlight of a visit includes exploring the narrow streets and alleyways of the Chaya district, especially after hours when the locals head out to enjoy a night out (you may even spot the occasional geisha). Kanazawa is also home to one of the country's top gardens, a picturesque castle, many shrines and temples, and numerous tea shops and museums dedicated to the cherished tea ceremonies and rituals. Expect to spend at least a half day here if you can spare it.